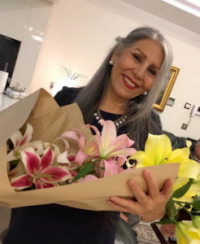 Australian Baha’is today welcomed the news that Mahvash Sabet, one of seven former Baha’i leaders in Iran jailed for their religious beliefs, has stepped free from prison after completing an unjust 10-year-sentence. Arrested in 2008, Mrs Sabet, now 64, and her six colleagues were subjected to a sham trial widely condemned by the international community, including successive Australian foreign ministers, governments around the world, the United Nations General Assembly, and the UN Secretary-General. Australian Baha’i spokesperson Natalie Mobini said Baha’is throughout Australia, including relatives of Mrs Sabet who now live here, welcomed the news of the release. “We now look forward to the release of the other six leaders, who should never have been jailed in the first place, but rather honoured for their service to society. “Even though Mrs Sabet has been released, the persecution of Baha’is continues and in many ways it is even worse than was the case 10 years ago, including widespread economic discrimination tantamount of economic apartheid. After Mrs Sabet’s arrest, her six colleagues were also imprisoned. All seven were held incommunicado and subjected to months of solitary confinement. They suffered appalling treatment and deprivations, including psychological and physical hardships. Their lawyer, Nobel laureate Shirin Ebadi, who had only brief access to her defendants, said the files showed there was “not a shred of evidence” for charges levelled at them, and none was presented at their trials. A former school principal, Mrs Sabet had worked with the National Literary Committee of Iran, but after the 1979 Islamic revolution was fired from her job and blocked from obtaining another one. While in prison, Mrs Sabet secretly wrote poems which were taken out of the jail and published in Prison Poems, a collection of high literary standard which gained international attention. The worldwide writers organisation, PEN, spoke out in her support. The six remaining Baha’i leaders, most of whom have relatives in Australia, are also expected to complete their sentences in the coming months. They include: Mrs Fariba Kamalabadi, 55; Mr Jamalodin Khanjani, 83; Mr Afif Naeimi, 55; Mr Saeid Rezai, 59; Mr Behrooz Tavakkoli, 65; and Mr Vahid Tizfahm, 43.